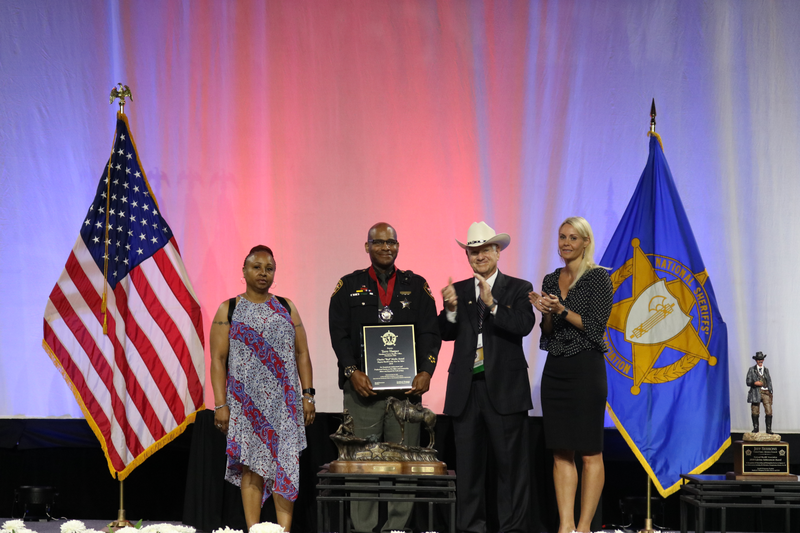 The Charles "Bud" Meeks Award for Deputy Sheriff of the Year was established to recognize deputy sheriffs who have demonstrated conspicuous bravery in the performance of their duties. There is one awarded for merit and one for valor. Deputy Terry L. Harper is a 28-year veteran of the Hamilton County Sheriff’s Office/ Jail Services Section and is assigned to 151 shift/ Intake, where he operates within the Court Holding section, M-F, from 0700-1500. On Wednesday, March 8, 2017, Deputy Harper started the day like every other day - stopping for coffee, for he and co-workers, at a United Dairy Farmers, on the way to work. After bringing two cups of coffee to the counter, Deputy Harper left to retrieve the third but on the way back, saw a man lying on the floor. Believing this to be a medical emergency, Deputy Harper approached the man but when he came around the ATM machine, he saw (who was later identified as) Simeon Thomas (MB/21) pointing a handgun at the store's clerk while screaming for him to give him "all the money". Instinctively, Deputy Harper broke cover, drew his weapon, and clearly yelled for Thomas to drop his weapon and get on the floor. When Thomas turned toward Deputy Harper, the handgun turned also. Fearing Thomas would fire at him, Deputy Harper fired first, missing Thomas but scaring him sufficiently that Thomas fled deeper into the store, to a dining room area. Deciding not to chase Thomas, further, into the store, Deputy Harper gave Thomas instruction to come back out, drop the gun and 'get on the ground' . Several tension-filled seconds had passed before Thomas yelled that he was coming out, placed the handgun on the counter and laid, face-down, on the floor. Deputy Harper directed the store clerk to call 911, approached Thomas and cuffed him. Simultaneously, a Cheviot Police Officer ran into the store. In the very short span, of mere seconds, Deputy Terry Harper saved 4 lives. He is a hero. Thomas was charged with 2 counts of Robbery, convicted and sent to prison for 6 years. As an aside, Detectives from our Patrol Division have said that Deputy Harper handled this situation "absolutely perfectly" and that they intend to use this situation in future training scenarios to demonstrate how an Officer should react because Deputy Harper "did everything right". This incident received extensive media attention and reflected the Hamilton County Sheriffs Office in an extremely positive light. Read Deputy Harper's complete nomination. Between April 2015 and November 2017, Detective/Corporal David McDougall established the bar for narcotics investigation and case management by performing his duties at an unprecedented level as a member and supervisor of the Harford County Sheriff’s Office Narcotics Task Force. His investigative tenacity and leadership by example are not only commendable but worthy of nomination for this prestigious award. In April 2015, then-Detective McDougall began an investigation into a drug trafficking organization, later named the Shropshire Drug Trafficking Organization (OTO). Through exhaustive investigation, he determined the OTO to be responsible for numerous fatal and non-fatal heroin overdoses in Harford County, Baltimore County, and Baltimore City. As the investigation grew, Detective McDougall found this drug trafficking organization's reach spanned through Harford County, Baltimore County, Northern Virginia, and Southern Pennsylvania and was responsible for hundreds of heroin overdoses in those areas. As the investigation developed, Detective McDougall partnered with the Baltimore County Narcotics Division, Drug Enforcement Administration (DEA), Federal Bureau of Investigation (FBI), and the United States Attorney's Office to take this case to a federal wiretap. McDougall 's goals were to identify the tentacles of the DTO and their reach, then to dismantle it and put its members in Federal prison for multi decade long sentences. The Title III portion of the investigation lasted several months, during which time a total of nine individuals were identified as holding key positions within the organization. All nine were indicted on numerous federal and state drug trafficking crimes, as well as, weapon offenses. In all, 1,303 grams of heroin, 193 grams of cocaine, 4 handguns, and $ 18,810 in currency were recovered during the course of the investigation. Detective McDougall also uncovered a potential police corruption connection with this organization and turned that information over to the FBI's Public Corruption Division. This lead yielded a separate yet parallel federal investigation. The investigation is still on going, and to date has resulted in eight Baltimore City Police detectives and sergeants, along with two Philadelphia Police Officers being federally indicted for racketeering amongst numerous other offenses. In November of2017, after a three-week trial at the Baltimore Federal Court House, all the individuals Detective McDougall indicted were found guilty on all counts and are expected to receive substantial federal sentences ranging from multiyear to multi decade incarceration. Corporal McDougall deserves to be recognized for the Charles "Bud" Meeks Award for Deputy Sheriff of the Year for merit. His continued tenacity and outstanding performance are exemplary. During this investigation, Corporal McDougall 's fairness and integrity were clearly evident in his pursuit of justice. Det/Corp. McDougal, second from left, receives the 2018 Charles "Bud" Meeks Deputy Sheriff of the Year Award for Merit from NSA President Harold Eaveson. McDougall's sheriff, Sheriff Jeffrey Gahler stands to the left of him. Read Det./Corp. McDougall's complete nomination. The Charles "Bud" Meeks Deputy Sheriff of the Year for Valor/Merit Awards were established to recognize deputy sheriffs who have demonstrated conspicuous bravery in the performance of their duties. 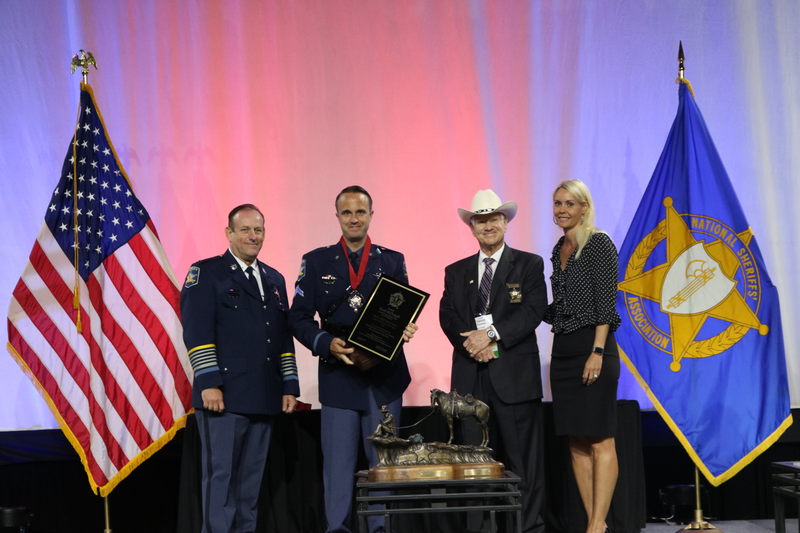 The award is given in memory and honor of Charles "Bud" Meeks, who served as executive director of the National Sheriffs' Association from 1989 to 1997 and in 2000. This award is sponsored by Motorola, Inc.